Deluca Massage & Bodywork has the biggest massage therapy facilities in the DC Metro Area and because of it we are able to accommodate parties of over 10 people at the same time. We are also able to come by your office to give you and your coworkers the opportunity to relax with our Corporate Chair Sessions. Contact us for more information. 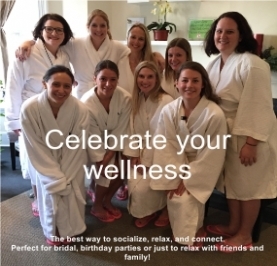 Create your own perfect celebration for birthdays, bridal showers and bachelorette parties, best clients or most valued employees. Celebrate a birthday, treat your employees to a wellness day or just get together with a few good friends. Nothing will make your guests feel special and pampered as a party Massage at Deluca. Let us pamper you for your special event! Ask us about Deals and Packages. Show your employees your appreciation for all their hard work, with a relaxing chair massage brought directly to you in the workplace. Workplace massage helps them perform better making your team more competitive by lowering stress. The result: reduce anxiety levels, increased productivity and happier employees!